The Amalfi Coast beaches are, contrary to what you might think, mainly consisting of paradisiacal bays, small natural shelters where the sea and the coast come together in a slow, sensual dance, which lasts an eternity. Composed mostly of pebbles, most of the Amalfi Coast beaches are located at the base of steep cliffs, so they are are accessible by sea with a boat. 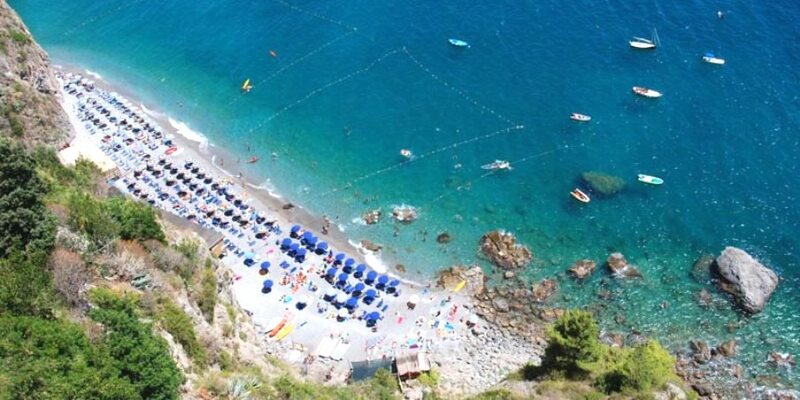 The most known beach of Positano is Marina Grande which represents perfectly the beaches of the Amalfi Coast. It is among the most desirable beaches from the jet set for its worldliness. 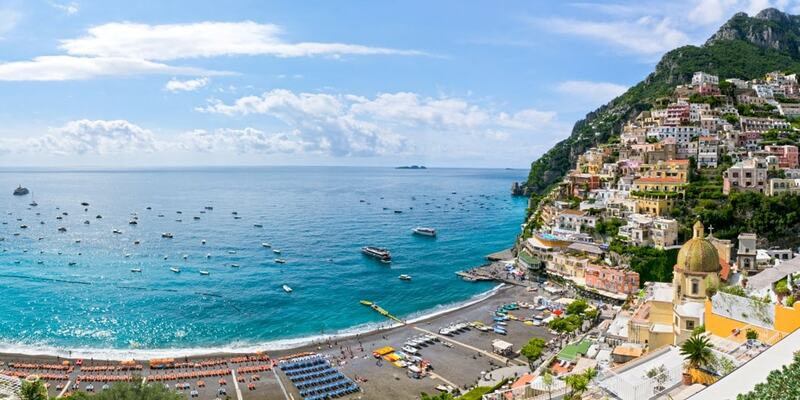 Backed by the colorful houses of Positano, the Marina Grande beach of Positano is the perfect place to spend a few hours in the sun and enjoy a cool drink. Among the most famous beaches of the Amalfi Coast in the second place we find Spiaggia of Marina Grande in Amalfi. The beach of Marina Grande It is among the most extensive and thanks to its central location is also the busiest in the summer from June to September. From the dock of largest beach in Amalfi boats depart to reach the many bays accessible only by sea. Not recommended for those who do not love the confusion and worldliness. The beach of Vietri sul Mare known as Marina di Vietri is among the few beaches of the Amalfi Coast to be sandy. Easily accessible by car and large enough, it is suitable for families and people who love the comfort. Actually in Erchie there are two beaches, the main beach of Erchie is about 200 meters long, which is overlooked by the houses of the small village, while the real highlight is the spiaggia di Cauco which is located between Torre Cerniola and Torre del Tummolo. The wonderful Erchie beach has crystal clear water and is surrounded by sheer cliffs; for this reason the Causo beach is accessible only by sea. Here the sun, differently from the beach of Marina Grande Amalfi, sets in the early afternoon. Furore, known for its magnificent fjord, it has a small ideal beach for late risers and arrive at the beach at lunch time, because the beach is sunlit only during a few afternoon hours. 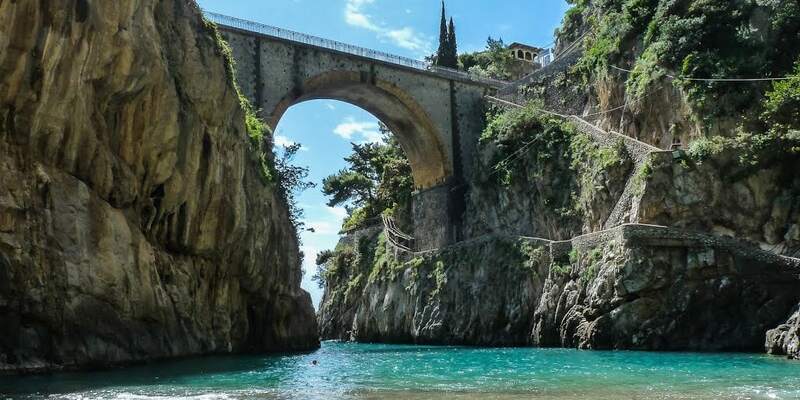 The Furore beach is among the most charming and photographed places of the Amalfi Coast, and can be reached by sea or down the steep stairways from the SS163 state road coming down to the sea. Set in a steep cliff overlooking the sea, the Cavallo Morto Beach is one of the many beaches of Maiori and is perhaps the most beautiful beach of Amalfi Coast. RReachable only by boat, this white sandy beach is a little oasis, in fact, thanks to the crystal clear and deep blue sea, it is suitable for those who practice snorkeling. The Gavitella beach is located in Praiano, it is one of the smaller beaches of the Amalfi Coast, it is only thirty meters long and is mostly made of pebbles. To reach it, like the other beaches of the Amalfi Coast, need to get off the stairs, but once you get down, the effort will be rewarded by the magnificent view that opens in front of you of Positano, the islands of Li Galli and Capri. It is one of the few places of the cliff from where you can enjoy the sun until sunset. Among the most hidden beaches of Amalfi there is certainly the beautiful beach of Duoglio. 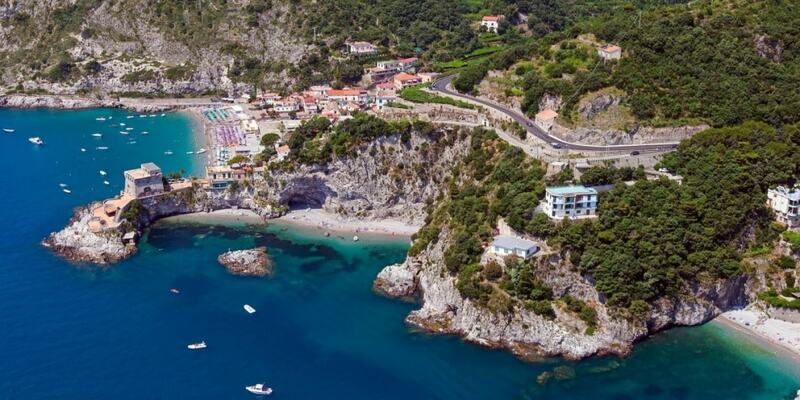 Coming from Vietri sul Mare, the Duoglio beach is one kilometer away from Amalfi, and can be reached from the SS163 by a long staircase of four hundred steps. The easiest alternative is to take a boat from Amalfi. If you are looking for cleanest sea of the Amalfi Coast, then this is the right place, the beach is mostly made of pebbles and is approximately 170 meters long. On the beach you will find: two public beaches and an area for the free bathing. The beach is sunny until early afternoon.